Syrians are not the most common refugees in California. Since 2012, the state has accepted far more refugees from Iraq, Iran, Burma, Afghanistan and Somalia than from Syria. The U.S. has taken only a sliver of the Syrian refugees that have resettled in the last year. That could change somewhat next year as more Syrian refugees arrive under Obama's plan. About 11 percent of Syrian refugees resettled in America since 2012 came to California; the state’s 39 million residents account for about 12 percent of the nation’s population. 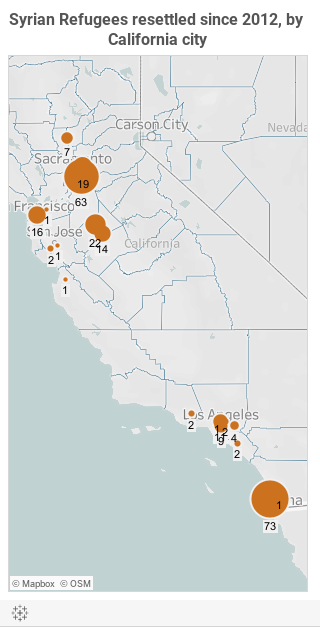 This map shows where in California Syrian refugees were resettled since 2012. Click here to see graphic if using the Bee's mobile app. Especially since the attacks in Paris, the opposition against Obama's plan to keep welcoming Syrian refugees into the U.S. has been growing. This 2-minute video provides a look at the numbers behind the people fleeing the Syrian crisis.